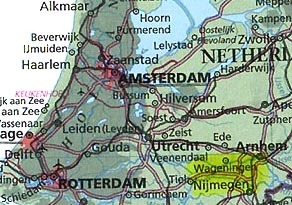 Wageningen, Holland (yellow) is the region a few kilometers south of Arnhem where both a suspected hoax crop formation and a genuinely mysterious formation in nearby Wijchen were reported respectively on June 11 and June 10, 2004. Robert Boerman, Founder of PTAH Foundation and Webmaster, DCCA Archive, Brummen, Holland: “Last Friday on June 11, we received an e-mail with a report near Wageningen in eastern Holland, a university town so we suspected a hoax. And the previous day on Thursday, June 10, we received a report about genuine crop circles near Wijchen, about 20 kilometers below Arnhem, not far from Wageningen. As we entered the school field, it was nice done and in the view from the top of the buildings, it was a good view of the circles. But when we entered the circle, but it seemed students had used a beer barrel to roll a pattern in the field. DID YOU FIND BROKEN STEMS? Yes, they were broken and bent and a lot of mechanical prints in the soil, so it was obviously manmade. You could see where someone had walked in there and was standing at the center of the standing crop. There was too much and we all decided it was manmade. 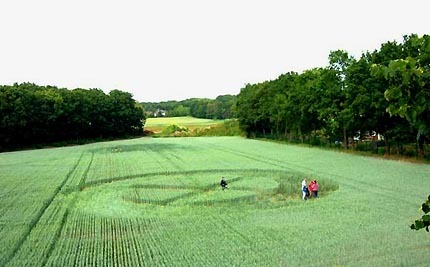 Reported June 10, 2004, eighty-five-foot diameter ring around standing wheat divided into four sections by two paths that did not cross in the center in Wijchen, Holland. Magnetic leyline anomalies as well. Photograph © 2004 by Robert Boerman. The wheat formation at Wijchen ­ it was a strange one. We have a new field worker who joined us and he did a good job measuring the ley lines. The Wijchen formation was a ring about 26 meters (85 feet) in diameter and the flattened ring itself was 6 meters (20 feet) wide, with a standing center. In the standing center, there were two parts crossing each other, but not exactly in the center of the standing crop. The standing center was approximately 14 meters (46 feet) in diameter. WHAT DO YOU MEAN IT WAS DIVIDED IN TWO PARTS? There was a horizontal and vertical pathway of 2-meter-wide (6.5 feet) paths, but they don’t cross each other exactly in the center. One of the paths was not a real straight line. It was a bit broken. But the weird thing that our new field worker measured in the ley lines, there were about six leylines crossing almost in the center of the standing crop. But there was also a leyline that came from outside the ring running to the center of the standing crop and then turned around and went back out into the field. So, the leyline turned around. We thought, ‘How is this possible?’ I have never measured any leyline like that in a crop formation before or anywhere. And that one was running to the center of the ring pattern and returned back to the field. At the other side of the formation on the north side was also a leyline coming into the circle in the ring and then turned around exactly in the standing crop. We also measured in the flattened crop of the ring, we measured three circles and the inner and outer circle was pulling energy downwards and in the center ring, the energy was going upwards. I don’t know what that means, but that’s very strange. Robert Boerman reports about Wijchen formation: “Leyline ‘A’ entered the circle from the south, ran to the center of the circle where it turned 180 degrees to go out of the circle. Leyline ‘B’ entered the circle from the north, ran to the standing crop of the center where it also turned 180 degrees. Another leyline ‘C’ was not a straight line, but undulated across the green rings. 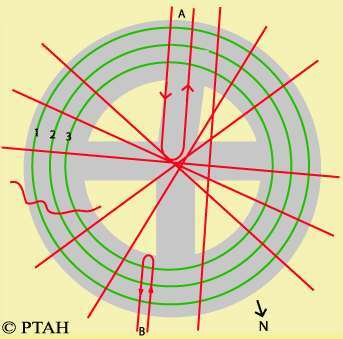 The green rings ‘1’ and ‘3’ are rings that had a downward flowing energy, while line ‘2’ had an upwards energy. Diagram © 2004 by Robert Boerman, PTAH. WERE THERE ANY EXTENDED OR BLOWN NODES, OR MELTED INSECTS? 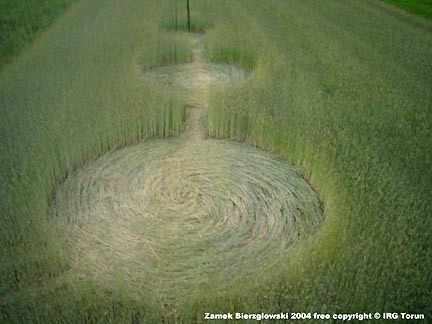 Two crop formations have been reported in a grass meadow in Zamek and Pigza near Torun, northeast of earlier formations in the Moglino region. 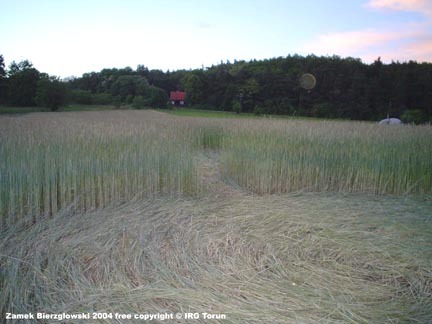 Robert K. Lesniakiewicz, Vice President of the CBUFOIZA (researchers in Poland who investigate unidentified aerial objects and crop formations) reports: “A new formation in grass on a meadow in the Zamek Bierzglowicki village near Torun, not far from Pigza and the Radioastronomical Observatory of the Mikolaj Kopernik University in Torun where one of the first Polish crop circles appeared in 1999. Pictogram in tall meadow grass reported on June 13, 2004, in Zamek, Poland. Photographs © 2004 by IRG Torun.